Hyatt Gold Passport is trying to get more people to book using its apps and is now offering bonus points to do so. 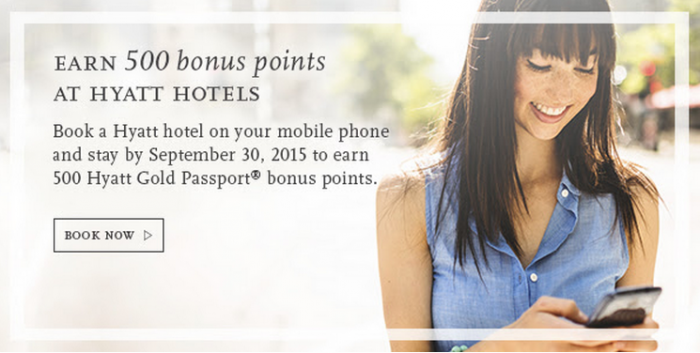 You can get 500 bonus points for a stay booked and consumed using the app between August 1 – September 30, 2015. It is unclear if you can earn the bonus points more than once. The copy and the T&Cs are silent on this. There is no landing page for this offer on Hyatt.com. This is an easy 500 bonus points (or perhaps more) for a stay during the offer period IF you can book using any of the Hyatt apps. To earn 500 Hyatt Gold Passport points under this offer, you must book a new stay on an Eligible Rate through the Hyatt App or the Hyatt Mobile Site. Both reservation and stay must be made and completed August 1, 2015 through September 30, 2015 at any Hyatt hotel, excluding M life resorts. Eligible Rate is defined in the Hyatt Gold Passport terms and conditions. All hotel reservations are subject to availability and must be made in advance.